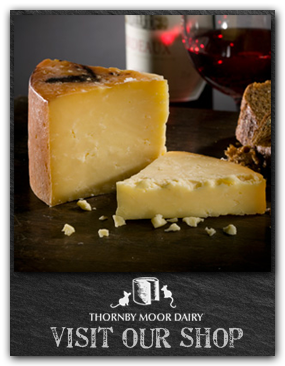 Thornby Moor Dairy was established as a specialist cheesemaker in 1979 by Carolyn Fairbairn. She set up a dairy in the basement of the family home, a converted Solway bank barn. Entirely self taught in the art of cheesemaking, she began by adapting a basic smallholder recipe to make Allerdale cheese using raw milk from her own herd of goats. Encouraged by a farming neighbour, production of raw cow's milk cheeses soon followed and Cumberland Farmhouse was born. Designed to be a territorial for Cumbria; an everyday cheese noted for its buttery texture. (The Solway Plain, which lies to the north of the Lake District, was once renowned for buttermaking.) In 1989 we became a founder member of the Specialist Cheesemakers Association whose Code of Best Practice we adhere to in the production of our cheeses. Over the years more cheeses have been developed using both Cow's and Goat's milk and, from time to time, Ewe's milk. In 1994 the Dairy expanded into its present premises at Crofton Hall, near Thursby and Carolyn was joined in the business by her daughter Leonie. Today, Carolyn continues to make cheese 5-6 days a week with the help of three assistant cheesemakers and Leonie deals with all the sales, marketing and administration.